Welcome! My name is Jane Ouweleen. I'm excited to share my travel experiences to three unique and beautiful countries. 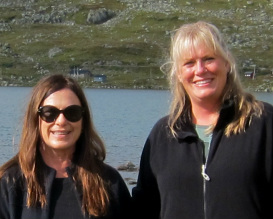 On this tour in September, 2011, I traveled with my friend, Dawn. We had traveled before on one of Rick's tours to Italy and enjoyed that trip so much that when we planned another trip, we knew we wanted to go again with Rick. What attracted me to this tour was the opportunity to travel to Russia, a country that I thought I'd never get to see. It turned out that while St. Petersburg was everything I imagined it would be, I was also surprised and delighted by our visits to Tallinn and Helsinki. In each city, in addition to our wonderful tour guide, Rick also used local guides that were engaging and informative. I came home with new knowledge of each country, its history and beauty, as well as respect for its people--and many photos! Click on the navigation bar or photos below to move to other pages. On following pages, each photo can be enlarged by clicking on it. Enjoy your travels! !